Interval workouts are intended to increase your race speed. The workout consists of a series of repetitions of an exercise phase and a recovery phase. Our coach determines and directs the workout. The speed at which you run the exercise phase is based upon your 5K minutes per mile running time; it is a guide to selecting the appropriate group. Use the tables below to determine your 5K pace time and the corresponding 400 meter time. Your goal is to complete the workout feeling good. That includes the warm-up, the workout, and the cool-down. Do not try to compete with others, they may cause you not to finish the workout. Settle in with a group that allows you to run at a comfortable pace. If not, drop back to the next group. Before leaving your home, know your average 5K minutes per mile and 400 meter running time. Use the pace charts below. For example, a 5K running time of 25 minutes translates to about eight minutes per mile or 2 minutes per quarter mile (400 meters). The coach will describe the exercise phase in these terms. Know how to get to the track and park. Plan on arriving early for your warm-up. Try to be on the track at 5:45 so that you can comfortably do a 10-15 minute warm-up of a mile or more, followed by some stretching. Bring water and appropriate warm-up/cool-down clothes. Finally, know your track. 6:10 – 6:15 Coach gathers the members. Be prepared to get to the starting area, you don’t want to miss anything he says. Club officers will make general announcements and introductions. Coach explains today’s workout and sends us out for one mile of “strides”. Strides are short quick efforts where you practice good form. They are followed by easy jogs. After finishing the strides we gather again at the starting line to do “the workout”. 6:25 – 7:00 Usually, a three mile interval workout. It is run counter-clockwise on the inside lanes of the track. The faster groups will go first, followed a few seconds later by the second group, and so on. Stay with your group at the agreed-to-pace in order to get the most benefit. 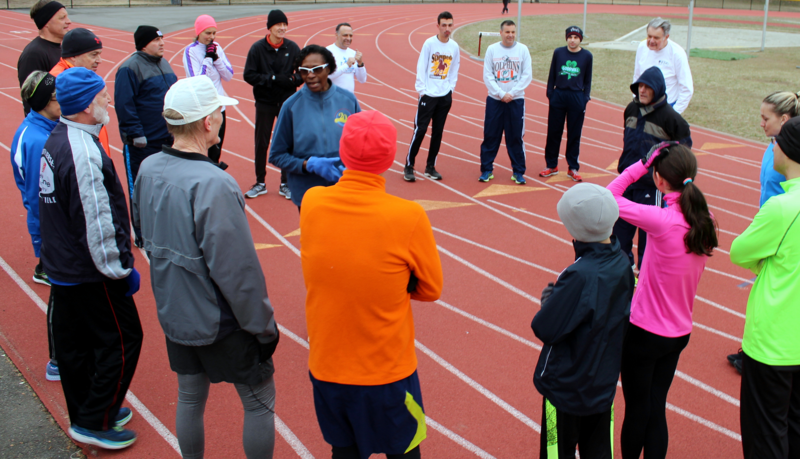 If a faster runner(s) come up behind you yelling “track”, slowly move with the group to the outside lanes, yielding the inner lane(s) to the faster runners.